Welcome to John F. Kennedy International Airport, also known as JFK. We are the largest airport in the state of New York. JFK Airport is New York's busiest airport, serving over 41 million passengers each year. As one of the busiest airports in the United States and one of the busiest international gateways, JFK Airport is truly a bustling hub of transportation in New York City. Our airport also handles more international air freight by value of shipments than any other airport in the United States. JFK Airport offers service to destinations in the United States, as well as to Canada, Latin America, Europe, Asia, and the Pacific and Australia/New Zealand. JFK Airport serves as the primary hub for United Airlines, a secondary hub for Alaska Airlines and America West, and a focus city for American Airlines and Air New Zealand. Construction began in April 1942, when the City of New York contracted for the placing of hydraulic fill over the marshy tidelands on the site of Idlewild Golf Course. Planned at first for 1,000 acres, the airport grew to five times that size. First commercial flights began on July 1, 1948. The airport was formally dedicated as New York International Airport on July 31, 1948. It was re-dedicated on December 24, 1963 as John F. Kennedy International Airport, following action of the Mayor and Council of the City of New York, and a resolution of the Commissioners of the Port Authority. Gifts shops located at JFK include Hudson News and Gifts, International Shoppes, and Discover New York. Duty Free stores at JFK include International Shoppes, World Duty Free America, and Duty Free. Foreign Currency Exchange desks are located at all terminal departure halls. Traveler's checks can be cashed and purchased at every terminal. Visa card and Master Card cash advances available at currency exchange counters located in all terminals. ATMs dispense cash from machines located in all terminals. Internet plug-ins are available at public telephones in all JFK terminals. There are two kinds of public parking at JFK Airport : Long-Term Parking and Daily Parking in the Central Terminal Area (CTA). Note: Jfk Airport Terminal 8/9 Alternate Parking is easily reached by following the "Jfk Airport Terminal 8 and 9" signs located on the Van Wyck Expressway. From there, take the free shuttle bus that departs every 15 minutes directly to JFK Airport Terminals 8 and 9. E-ZPass Plus is not available in this lot. The Long-Term Parking Lot is located at Lefferts Blvd., approximately 4 miles from Terminals 1 through 9. If you are traveling eastbound, take Exit 19, and bear right at the exit towards Lefferts Blvd., and turn right at the first intersection onto Lefferts Blvd. The entrance to the lot is ahead on the right. If you are traveling westbound, take Exit 18B, turn left at the first traffic light onto Lefferts Blvd., go over the overpass over the Belt Parkway, and the entrance to Long Term Parking will be ahead on your right. From the JFK Expressway entrance to the airport, follow the Long-Term Parking signs through the Cargo area to Federal Circle, and from there to the Long-Term Parking Lot at Lefferts Blvd. From the Van Wyck Expressway, take the Federal Circle exit, turn right immediately after you exit and follow signs to Long Term Parking. The Howard Beach Station AirTrain operates between the Central Terminal Area and Long Term Parking Station A or Station B every 4-8 minutes between 6AM and 11PM, and every 12 minutes between 11PM and 6AM. From Station A or B to the Central Terminal Area takes about 8 minutes. Please allow at least 30 minutes to reach your terminal. E-ZPass Plus is available in the Blue, Green, Yellow, Orange and Long-Term Lots. (PressMediaWire) WASHINGTON October 9, 2008 – The Bush Administration is committing almost $90 million over the next eight years to expand capacity at John F. Kennedy International Airport, U.S. Secretary of Transportation Mary E. Peters announced today. She also unveiled new rules designed to lower fares, increase consumer choices and improve service for air travelers using JFK, Newark and LaGuardia airports. The Secretary said the U.S. Department of Transportation will sign what is known as a “Letter of Intent” committing the federal government to invest $89 million between 2009 and 2016 to fund a series of taxiway improvements at JFK airport. The taxiway improvements include constructing two new taxiways, extending or improving six others and creating new high-speed exit taxiways. The taxiway work will make it easier for aircraft to maneuver between gates and the airport’s runways, cutting travel time and limiting delays, the Secretary said. She added that the new high-speed exit taxiways will reduce inbound delays to aircraft arriving at JFK. Secretary Peters said that the construction work was expected to begin in 2009 and would be completed by 2014. She added that the Department also was working with local airport officials to move forward on a range of other needed capacity projects, including additional taxiways and other airfield improvements. She said that until the capacity improvements can come on line, the Department has limited the number of flights that could operate in a given hour at JFK and Newark airports. Combined with existing “caps” at LaGuardia airport, the Secretary said that service at the airport was at risk of stagnating since other competitors are locked out of the market. She cautioned that studies have found airfares at capped airports run 11 to 15 percent higher than at comparable airports without caps. In order to keep the New York aviation market open to new services that would promote competitive fares, the Secretary also announced final rules to auction a limited number of landing and take-off “slots” at each of the region’s three airports. Under the final rules, airlines operating at JFK, Newark and LaGuardia would receive a 10-year ownership of the vast majority of FAA slots they currently operate, the Secretary said. However, the new rules call for a gradual auctioning over the next five years of up to 10 percent of the landing and take off slots these airlines currently operate free of charge today. She added that the rules also would lower the hourly operating cap at LaGuardia airport from 75 slots per hour to 71 slots per hour by “retiring” an additional five percent of the slots currently being used, cutting delays by an estimated 40 percent. Under the rule for La Guardia, existing airlines would keep 988 of the slots they currently operate. The remaining 113 slots would be made available over the next five years by auction to airlines interested in starting new service or expanding current operations at the airport. In addition, under the rule for JFK and Newark, existing airlines would keep 1,035 of the slots they currently operate at JFK Airport and 1,154 of the 1,245 slots they currently operate at Newark Airport. The remaining 89 slots at JFK and 91 slots at Newark would be made available over a five-year period for airlines wishing to expand their current operations or start new services at either of the airports. The Secretary said that as a result of the auctions, all airlines would have an opportunity to enter or expand current operations in the New York market. She noted that additional competition like the kind the auctions would bring is proven to lower fares and improve service. She noted, for example, that fares declined by 25 percent at Philadelphia International Airport after a new airline entered that market in 2004. She added that when a new airline began serving JFK airport in 2000, fares fell to some destinations by as much as 50 percent. OCTOBER 09, 2008 -- To the dismay of airlines, the U.S. Department of Transportation said it would proceed with its plan to auction some slots at the three major New York City-area airports, according to a final rule released today. Despite the mounting opposition, DOT today defined final plans to gradually auction "up to 10 percent of the landing and takeoff slots these airlines currently operate free of charge today" at John F. Kennedy, LaGuardia and Newark airports. DOT said the rules call for airlines to maintain a 10-year ownership of "the vast majority of FAA slots they currently operate." The auctions would begin next year and continue through 2014. At LaGuardia, the ruling calls for the capping of slots at 71 operations per hour, down from 75, with the aim to cut delays at the airport by 40 percent. Airlines would maintain control of 988 airport slots, while the remaining 113 "would be made available over the next five years by auction to airlines interested in starting new service or expanding current operations at the airport." DOT called for similar actions at JFK, where it plans to auction 89 slots over five years, and at Newark, where 91 slots are slated for auction in that period. DOT said any airline could bid in the auctions to "have an opportunity to enter or expand current operations in the New York market." "Without slot auctions, a small number of airlines will profit while travelers bear the brunt of higher fares, fewer choices and deteriorating service," U.S. Transportation Secretary Mary Peters said in a statement today. "Slot auctions, meanwhile, will keep flights to New York affordable, available and vibrant while giving all airlines an opportunity to compete in one of the world's most popular aviation markets." ATA, the major domestic airline lobbying organization, continued to deride DOT's plan, calling the auction ruling "ill-conceived and one that will result in a lengthy and costly legal challenge." ATA president and CEO James May today noted that the DOT ruling "patently defies the recommendation of the Government Accountability Office, as well as the will of Congress, by attempting to move forward with an illegal auction of airport slots." Peters called the auctions a short-term measure to curb delays. Other measures include already-implemented flight caps at JFK and Newark, and today's new cap plan at LaGuardia. Though Peters noted studies that find airfares at capped airports can be up to 15 percent higher than those at "comparable airports without caps," she expects the auction plan to keep fares competitive in and out of the New York City-area airports. Peters today said flight capacity expansion at JFK is the foundation of a longer-term plan to curb delays. DOT today announced the commitment of $89 million through 2016 to expand capacity at JFK, including the construction of two new taxiways and improvements to the six others at the airport. Peters expects construction to begin next year with a target for completion in 2014. "The best way to cut record airline delays nationwide is to expand the limited capacity at New York's airport," Peters said. "Building new taxiways or adding new runways takes time, though, which is why we're also putting in place measures to cut delays and keep service vibrant over the short term." how to get to jfk airport:The best way to get jfk airport to hire limousine or car service. it is easier and affordable. you can call ASM Limousine Service at 1 718 790 1312 or visit on the web www.asmlimousine.com for your all transportation needs. JFK Terminal 1 serves Aeroflot, Aero Mexico, Air China, Air France, AirPlus Comet, Alitalia, Austrian Airlines, China Airlines, Japan Airlines, Korean Air, Lufthansa, MAXjet, Olympic, Royal Air Maroc, and Turkish. JFK Terminal 2 serves Continental, Continental Express, and Song. JFK Terminal 3 serves Comair, Delta, Delta Connection, Miami Air, Saudi Arabian Airlines, and Sun Country. Terminal 4 at JFK International Airport is one of the most modern, efficient, spacious and unique terminals in the New York area serving 45 international and domestic airlines carrying nearly 9 million passengers per year. Regarded as the Terminal of Choice, Terminal 4 offers travelers a commitment to passenger service, while airlines benefit from a dedicated management company that oversees all landside and airside operations. JFK Terminal 4 serves Aer Lingus, Aerolineas Argentinas, AeroSvit Ukrainian Airlines, Air India, Air Jamaica, Air Tahiti Nui, Allegro, Asiana, Avianca, Azteca, Biman Bangladesh, BWIA, Corsair, Copa Airlines, Czech Airlines, Egyptair, El Al, Emirates, EOS, Eurofly, Israir, JetBlue (San Juan), KLM, Kuwait Airways, Lacsa, Lan Chile, Lan Ecuador, Lan Peru, LOT, LTU, Mexicana, North American, Northwest, Pakistan International Airlines, Royal Jordanian, Singapore Airlines, South African Airways, Swiss International Air Lines, TACA International, TAM, Thai Airways Int'l, Travel Span, Universal, USA 3000, Uzbekistan, VARIG, and Virgin Atlantic. JFK Terminal 5 - Under construction until 2008. JFK Terminal 6 serves JetBlue. JFK Terminal 7 serves Air Canada, US Airways/America West (Domestic), US Airways/America West (International, Canada & Mexico), ANA (All Nippon), British Airways, Cathay Pacific, Iberia, Icelandair, Qantas, and United Airlines. 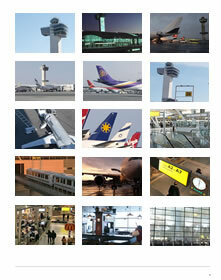 JFK Terminal 8 serves American, Finnair, Malev Hungarian, and SN Brussels Airlines. JFK Terminal 9 serves American, and American Eagle. The Way From JFK Airport To Any Dirrection is by Car. Basically there is no train or subway available for laguardia airport.